Independent expert development driver confirms class-leading realism achieved by exceptional frequency response and low latency across the entire range of travel. The aVDS has been confirmed as the market leader through performance tests and an independent review. The results highlight the aVDS’s consistency of response across a variety of positions throughout the entire operating range. This level of consistency is essential in providing accurate feedback on vehicle development and enables a simulator to be used in new applications, such as autonomous vehicle development. The low latency of the system (as little as 4ms in roll) helps the driver to feel smaller changes, making the simulator more useful: for example, in modelling secondary ride. In those degrees of freedom important for ride (pitch, roll and heave), the system has achieved bandwidths of 50Hz, which is vital for effective simulation. 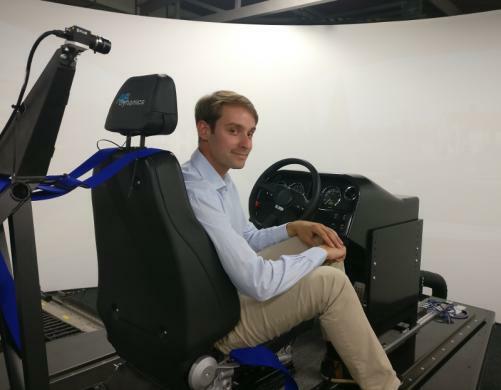 The aVDS next-generation vehicle driving simulator has been developed by AB Dynamics using an innovative motion platform and proven motion control techniques designed by Williams in its Formula OneTM operations, with immersive digital content provided by leading software supplier rFpro. The reduced latency and increased frequency response of the aVDS, compared to alternative systems, allows customers to complete more test, development and calibration tasks without a prototype vehicle. The high excursion capability of the aVDS ensures plenty of travel for effective motion cueing, enhancing the impression of changes in speed and direction. The low latency ensures that all the driver’s senses are cued at precisely the right time, increasing realism and helping to eliminate the motion sickness that can be felt in some systems. The consistently high frequency response throughout the full range of travel is achieved by the unique arrangement of the motion platform, which ensures accurate simulation of vehicle attributes, including ride quality and steering feel, wherever the moving platform goes. “As new models continue to proliferate, vehicle dynamics simulators help to alleviate time and budget pressures by providing engineers with the physical experience of driving a vehicle, but in the repeatable environment of a laboratory,” explained Simms. “Until now, the range of applications has been constrained by the physics of the motion platform, which has generally limited most successful simulator use to human machine interface and ergonomic studies. The high performance required for vehicle dynamics applications has not been available. To see an animation that illustrates the novel Williams-designed aVDS mechanism, click here.